As a Microsoft mixed reality partner, we’ve been excited about the prospect of a new Hololens device for months. The original Hololens device has been instrumental in some of our past projects, including the development of RIVO – a software developed specifically to revolutionise fire safety procedures for a number of industries. We used Microsoft’s Inside Out tracking, and 3D mapping capabilities, to enhance fire safety protocols by drawing up critical information in real time, be it emergency evacuation points or fire routes. This created a fast, digital and accurate solution which dramatically decreased safety risks in the event of a fire. One of the most exciting features to look forward to is Microsoft’s Dynamics 365, their product line of enterprise resource planning and customer relationship management applications which have been integrated to add another dimension in industry training. Microsoft released several mixed reality business solutions last year to the range and given Hololens 2’s incredible logistical and performance enhancements it’s safe to presume that more and more industries and companies will be looking at them to increase efficiencies within their day to day working environments. 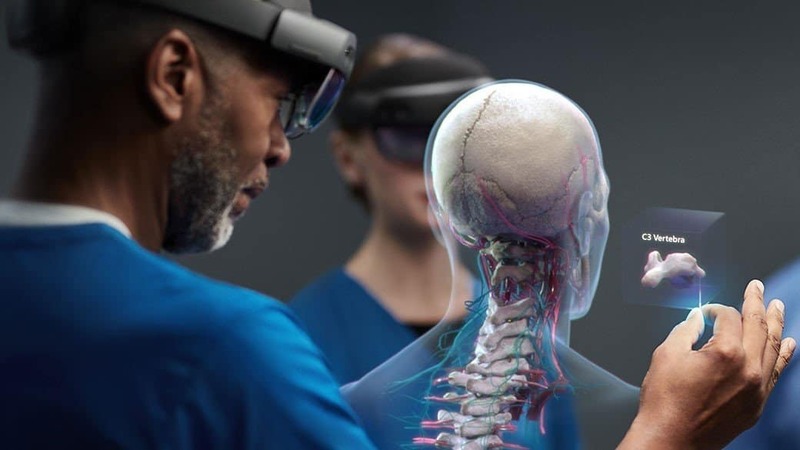 Microsoft Dynamics 365 will allow companies to easily create heads-up, hands-free holographic training materials for employees so they don’t need to flip through a text book or potentially put themselves in dangerous situations. This gives employees the ability to immerse themselves in real-life dangerous situations through the use of a cross-reality experience. The result? It prepares workers for emergencies and equips them with the skills to react quickly if those dangerous situations arise in real life. For industries such as construction, transport and manufacturing these could reduce the risk of injuries significantly. The addition of eye tracking opens up a host of new functionality for HoloLens apps. This ranges from reducing logins and increasing security through retina recognition to allowing for more intuitive ways of interacting with objects and interfaces. Retina tracking has been a highly anticipated feature in VR and AR as knowing the distance between the pupil for each user is essential to be able to render visuals smoothly and correctly. In most VR headsets and the previous HoloLens this has been a manual process and not often successful. In fact, it has been one of the main criticisms of the new Oculus Quest headset where the feature is not available, meaning that if a user hasn’t already been identified by the Oculus Quest, 30% of the population are unable to take advantage of this feature. Eye tracking combined with new and a larger variety of responsive gesture commands should make the Hololens 2 even more effective and easy to control in demanding work environments. In the first HoloLens Microsoft introduced Spatial Anchors. Spatial Anchors are a tool which allows an object’s position to be locked in physical space. For example, a cube arranged on top of a physical desk with a Spatial Anchor applied will remain fixed even as an observer walks around the room. The tool was beneficial for low-scale AR used in small rooms but as HoloLens has introduced features beneficial for a number of industries and factory environments, the WorldAnchors feature allows items to be tracked and recorded on a much larger scale. This will be beneficial to a range of different sectors but especially the architectural, construction and manufacturing industries. For example, in architecture the ability to walk around a large building site as it’s being created and place, move or visualise different objects could save a huge amount of time identifying clashes and reducing rework. It also invites collaboration between architects, workers, contractors and the client to perfect the finer details of the environment and eliminates possible construction errors going forward; creating a more efficient system from start to finish. The addition of WorldAnchors to the manufacturing industry is a whole new prospect entirely. It means technical information and rich data can be anchored to physical assets across large estates. This combined with Microsoft Intelligent Edge and Azure cognitive services is creating a whole new way to visualise production, find faults and introduce predictive maintenance. The Hololens 2 demonstrates the rapid growth of both the development of cross reality as it makes its way into the mainstream and the speed in which new software is being developed for just about every industry you can think of. The features I’ve highlighted are only a glimpse of the capabilities that the new headset has. It’s a device that we are already using to develop an exciting new project here at Luminous Group, set for release this summer. The infinite possibilities the newest features added to the Hololens 2 can be used for is certainly an exciting prospect for us and our upcoming projects. This article was written by Ben Bennett, Managing Director of cross-reality experts Luminous Group. NextHow much does graphics matter with the Oculus Quest?